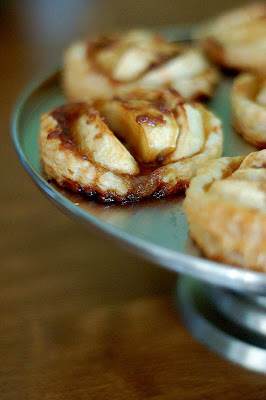 These apple tartlets looks too good to be eaten and you guys really look soo good together. This simple little treat is perfect for any thing! Looks wonderful, Anne. Hope you are feeling good! Your tarts are so cute! They were delicious. Cute pic of you and your hubby. Hope all is going well with you this summer! Your tartlets look sooooo cute! I don't know which is sweeter - the lovely tartlets or the loving couple! Well done. Beats your regular basketball game fare any day! Golly - they're beautiful. Very nicely done. I put cinnamon on mine. Your tartlets look fantastic! I love the fluted cookie cutter you used to cut the rounds of dough. 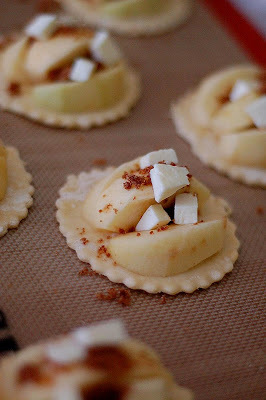 These are fabulous and I even used phyllo shells instead of puff pastry (just for my hips ;). I can't wait to splurge someday and use puff pastry! Awesome. *sigh* these do look easy and delicious.. I want to be back on top of the Eiffel Tower with my hubby. Cute tarts! These turned out just beautifully! Nice work! What a cute picture! And your tart looks great!! You two are so cute! And so are the tarts. We loved these. 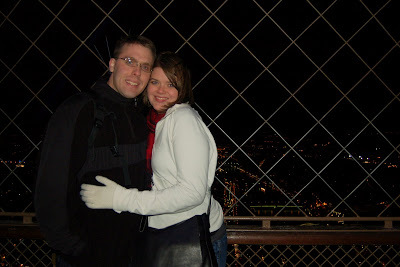 CUTE picture of you & hubs in front of the Eiffel Tower! Your tartlets are adorable. It is really hard to beat this one. It's practically effortless, and who wouldn't love this? I like the before and after baking pictures. And I wish I'd cut my apples in slices like yours--they might have cooked through better. I'll have to remember that for next time. I love your little tartlets! They are so cute! Your lovely little plate of tartlets is so pretty! They look beautiful and delicious! I love little individual deserts. Yum! Very Nice! I also love your pink sandwich cookies. Those are great! So pretty I could grab it right off the page! Easy, too. I agree- never had a bad pastry in France. And can't remember a bad meal either. Nice romantic photo! These look so yummy. I love apple pie, tarts, pastry etc... This looks so easy, especially when I have a craving but not time for a whole pie. I'm definitely going to try them. You are so right about the pastries in France! The croissant you get on the airplane coming back from Paris is better than 90% of the croissants you get here. I digress (what else is new). Your mini tarts are so precious! 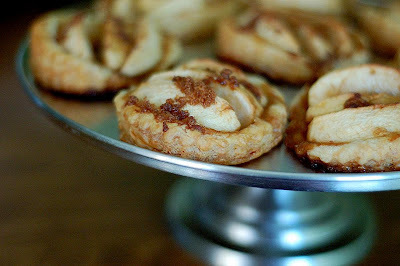 Parisian apple tarts at Lakers games...I sense a trend! What a great easy accessible recipe. A great reminder to keep it simple. i wanna to try it..